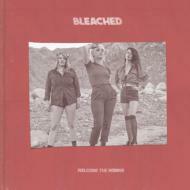 Los Angeles-based sister duo Jennifer and Jessie Clavin knew things were going to be different for their band Bleached's 2016 sophomore LP Welcome The Worms. Not only had they managed to charm world renowned producer Joe Chiccarelli (Morrissey, The Strokes, Elton John) to join the sisters and their bassist Micayla Grace in the studio, but Jen and Jessie had been crawling out of their own personal dramas. While emotionally spinning, they dove head first into music. The three girls spent time writing the 10-song LP at a remote house in Joshua Tree, away from the distractions of the city. Other times Jen and Jessie worked alone, just like when they were teenaged punk brats playing in their parents' garage, imitating their heroes The Slits, Black Flag and Minor Threat. In the studio, Chiccarelli and co-producer Carlos de la Garza (Paramore, Yacht) helped the band perfect their fervent songs into fearlessly big pop melodies. They drew inspiration from the iconic hits of everyone from Fleetwood Mac to Heart to Roy Ayers. The result is an ambitious rock record with a new found pop refinement that somehow still feels like the Shangri-Las on speed, driven forward in a wind of pot and petals, a wall of guitars in the back seat.